Step 1 In a small sauce pot, combine creamed coconut, sugar, vanilla and salt over medium heat. Whisk until the sugar has dissolved and the creamed coconut has melted, about 3 minutes or so. The mixture may seem a little bit sandy. Step 2 Get out an 8×8 baking dish. Dump the melted coconut/sugar mixture into the pan. Let it cool a bit, and then use your hands to press the mixture flat into the dish. The dough will only take up about 3/4 of the baking dish. 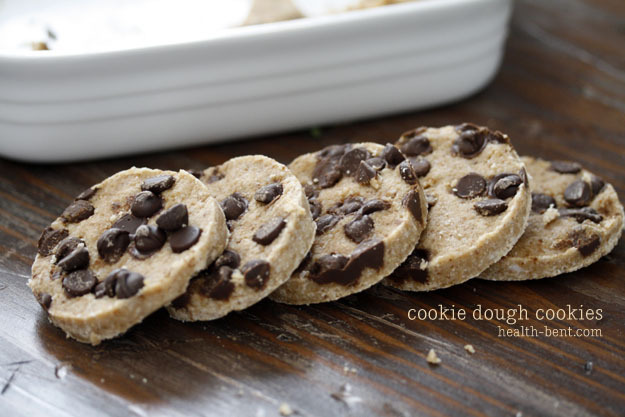 Scatter the chocolate chips on top and press them into the dough with your hands. Step 3 Place in the refrigerator to cool and then use a cookie cutter, or a knife, to cut into desired shapes. LaraBars were on sale the other day. I hadn’t eaten one of those things in years, so I bought a few. Chocolate Chip Cookie Dough, amongst other flavors. Besides the fact that the bar was about the length of my pinky finger, the flavor was so amazingly disappointing. It tasted so “healthy”…and nothing like the cookie dough flavor Lara promised. Bleh. So I figured I could make my own version of the Chocolate Chip Cookie Dough Lara Bar, switching out the mass of nuts & dates for coconut butter.